You'll also learn effective meditation techniques to gain focus in all that you do, plus easy exercises for greater energy than ever before. Feng Shui Chic will help you achieve your greatest goals...and prosper in every part of your life -- today, tomorrow, and in the time to come. 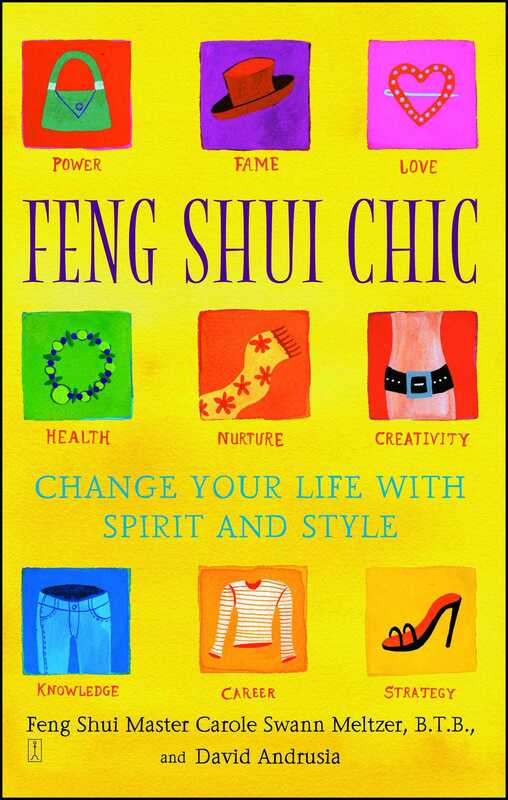 Chapter One: What is Feng Shui Chic? Feng Shui Chic. As I look at these three words, I can't help but smile. After all, the very word chic implies all that is trendy and new. And while I am the biggest devotee of feng shui anywhere, it's hard to think of this ancient practice as trendy or chic! Yet that, my friends, is exactly what this book is about: Feng Shui Chic. This is because what we wear, how we dress, our makeup, and even the scent we wear influences our energy, and thus whole aspects of our lives. It's about looking and feeling your absolute finest through the principles of feng shui not sometimes, not once in a while, but for every day of your life. About ten years ago, after moving back to the States following many years in Asia, I began to incorporate Feng Shui Chic into the traditional feng shui I was performing -- and the results of this combination were fruitful indeed. I believed I had touched upon a winning synthesis of personal and spatial feng shui. Feng Shui Chic is based on the study and practice of Chinese aesthetic medicine. Used for centuries, this practice combines medicine with aesthetics. Why? Because in Asia, psychological and physical health are seen as one and the same, not as two distinct, unrelated forces. In fact, beauty -- seen as somewhat superficial to Western minds -- is a function of body alignment. And if you know just a bit about Chinese medicine and body meridians, you know that body alignment is seen as a form of preventive medicine -- the first step to beauty inside and out. A large part of this book is about achieving wellness through internal, as well as external, health. By balancing energy, we balance our internal organs in conjunction with spatial alignment. While pondering the various uses of feng shui, it struck me: In modern society, we feng shui our houses, our offices, our apartments. But, unlike many people in Eastern cultures, we don't feng shui ourselves. Feng shui, after all, isn't merely about moving a piece Of furniture If it were, we'd all be as rich as Anna Nicole Smith, as skinny as Courteney Cox Arquette, and as professionally successful as Carly Fiorentina, the head of Hewlett-Packard. Sometimes, the best ideas are those that are staring you in the face. Why hadn't I, a fashionista from the word go, thought about this earlier? a chic scarf can look so Audrey Hepburn-like in some circumstances, and so pretentious and showy in others? a form-fitting skirt can set the world on fire in some settings, and just look slutty on other occasions? a boxy suit can invest you with authority in key situations, and do nothing for you at other times? And thus the notion of Feng Shui Chic was born. After coming to this conclusion about the missing adoption of personal feng shui for American audiences, I began working with friends, family, and private clients. Today, after years of modification and change, I can say with certitude that using this system -- the steps of Feng Shui Chic -- will let you have the power and passion you so richly deserve in all aspects of your life. But that's just the start! While looking wonderful -- and of course, superstylish -- is certainly a goal we all share, there's much more to this book than that. Because by using the guidelines of Feng Shui Chic, you can change not only your dress and appearance, but many other aspects of your life. In so doing, you can attract a whole new range of opportunities to you. Sound too good to be true? I assure you, new friends, that it isn't. I know that this system works because I have seen its results in the thousands of women -- clients and friends alike -- with whom I have worked over the past twenty years. This is the start of a whole new way of living for you. In a phrase, it is the beginning of a life of Feng Shui Chic. Have you ever wondered how some people seem to flow effortlessly through life, achieving their heart's desires and then some? And how, conversely, others among us face a series of roadblocks so daunting that we sometimes wonder how to make it through yet another day? We speak, don't we, of "golden girls" or of "the boys of summer," those women and men who seem to have it all from the day they were born. While there's no denying the powers of circumstance and fate, it is equally true that we can chart our own destiny if only we know how. Gaining this power in order to make the most of your life is what this book is all about. ...all while looking more chic than you ever dreamed you could. Sound too good to be true? Odd? Impossible to achieve? At first blush, perhaps it does. But I assure you -- and I say this only from years of experience -- that all of the above are possible when using the easy-to-follow program of Feng Shui Chic. More than anything, this book is about finding personal power and harnessing its force to gain the best out of your life...today, tomorrow, and in the times to come. "But how is this possible?" you may well ask. To know the answer to this question, you Must first know more about the ancient practice of feng shui...and telling people how to change their lives through feng shui is what I like to do more than anything else. In the following chapter through chapter five, I will provide you with the basics of feng shui, with a special focus on how you can adapt these ancient traditions to your daily modern life. Once you have this understanding, I'll be able to show you how chi energy can interact with your body, fashion, color, and scent to maximize life opportunities...and how you can achieve balance in all aspects of your life. In this way, you will have a potent formula for change -- and be able to achieve personal enrichment of the most satisfying kind. Of course, if you are eager to find a Feng Shui Chic solution to a pressing problem, you may go straight to the appropriate chapter now -- e.g., chapter six for love, chapter seven for career. How can you do this? Because when you have a headache, you take an aspirin with complete confidence that it will lessen your pain, even though you may not be able to explain precisely how or why it works. Similarly, while it is best to have a basic understanding of the principles of Feng Shui Chic, you can use this system with complete confidence that it will solve almost any problem -- without your needing to know the whys and wherefores as fully as a feng shui master does, and looking your best while you do. I've always felt that one reason the very real benefits of feng shui have been derided in some circles is that the critical parties do not understand the true nature and background of this ancient art. To be perfectly fair, I can understand their concerns, because many Western practitioners use a form of feng shui that is but a weak dilution of its Asian origins. Most important of all, it is vital to recognize one fact: Feng shui is not a quick fix, an easy answer, or a one-time solution. It is an ongoing practice, one that changes with the season, with your immediate goals, and with your situation in life. Far from being the stagnant concept some Western writers have described, feng shui is as flowing and as constantly changing as life itself. Know this: I am not advocating that you blindly let feng shui dictate what you do in any aspect of your life. Far from it, as feng shui (and let's Correct another misconception) is about letting you take an active role in the direction of your life. In a nutshell: We can use feng shui's principles to work for us, and that is what you'll learn to do here. All this will become apparent when we get into the chapters dealing with the nine zones, or life areas, which begin on page 72. For now, this is what you should know: "Where am I going?" and "What do I intend to do/achieve?" are the mantras that are the primary focus of this book...and the ones you should repeat to yourself every day of your life. Is Feng Shui Chic About Color? Frankly, Feng Shui Chic is not merely about what color or cut of clothes to wear. Nor is it a traditional wardrobe guide. It is, however, about using style to achieve your goals and dreams -- and look absolutely fabulous as you do. Interestingly, this is something Asians have always known: how to align with the season in order to balance oneself with the environment...and how to attract the very best from all the richness that exists in the outside world. At this point, I know you're eager for an example. Hold on, honeys -- and let's look at precisely how this works. In the warm seasons, for instance, we need to balance the external temperature with water energy, which cools us down by optimizing our chi. We do this by wearing more blue, green, and black. At the same time, wearing unstructured clothes helps us balance the heat of the day. Conversely, in winter, we need to add fire elements to our wardrobe, with red the best color choice. In this season, structured clothing helps keep us warm from the raw elements outside. Of course, these notions represent a mixed bag. Some are traditional others more in line with Feng Shui Chic. But all have this in common: They show how we use color to suit a season or mood, just as Asians have done for centuries on end. How did they do this? In China, folk went so far as to color their clothes with the plants of the season, using bark, berries, and grasses to be in touch with nature in a very visceral way. Here's the best part: In the zone chapters coming up soon, you'll learn how to do so scientifically, based on the Chou Silk manuscripts that have only recently been discovered by Western eyes. This is because the Chou Silk manuscripts contain the most complete information ever recorded on how the ancients used color, season, and cycles to manage many aspects of their lives, from agriculture to social interaction. In many ways, the concept of Feng Shui Chic is based on my knowledge of these manuscripts, which align color with season more intricately than, until recently, had ever been known in the West. My system is based on these ancient texts -- the first program ever Crafted for modern readers in America and beyond. Equally important is that yellow also signified the so-called "mandate of heaven," and it announced the grand emperor as the "Heavenly Ruler." In ancient China, rulers were so omnipotent that they were loath to separate themselves from the divine powers from which they declared themselves descendants. During the "dog days of summer," Grand Emperor Huang Ti lived in a singular residence known as the Temple of Ancestors and wore his traditional yellow. This color -- not only bespoke his imperial roots, but was deemed, in the pages of the old Chinese Almanac, to be good feng shui as well. Interestingly, feng shui also dictated Huang Ti's food choices. As autumn drew near, the emperor moved to three Western Palaces. In this location, he wore white, a color associated with the harvest. He ate dog (as is still done in some Asian lands) and sesame, as dictated by feng shui. When winter arrived, the emperor moved to the Northern Palace. He wore black garments as per his element sign and time of year. How were the grand emperor's colors and foods chosen? By his element sign, as determined by the date of his birth. Each element -- wood, earth, water, fire, and metal -- thus corresponds to a specific personality type and informs your feng shui colors as well. As we soon shall see, these change both with the season and with the time of day (or night). Just as the emperor ensured his good health, expanded his wealth, and achieved peace in his personal life through feng shui, so, too, will you. That is the basis of Feng Shui Chic. How important was the use of color in dress back then? Proof positive is this: Anyone who dared to wear the emperor -- only yellow was immediately put to death. Suffice it to say that personal feng shui was considered a matter of no small consequence among the ancient Chinese! In the first two cases, especially, these color choices have sprung not from whim, but from carefully orchestrated (and evolving) social patterns. As such, they provide a social, as well as cultural, context for how and why we wear color at different times in our lives. Literally, feng shui translates as "wind and water." Its greater meaning, however, is more metaphorical. In its deepest form, feng shui has to do with the flow and balance of natural energies, all of which lie between the boundaries of water and wind. in fact, the fullest, most complete use of feng shui is in the blending and unifying of these two forces. By so doing, we bring nature and humankind into balance. We also achieve the sense of harmony that is requisite to achieving inner peace...and this sets the stage on which to reach our goals. What is the significance of water and wind? Water and wind show movement and change in nature. Their combination creates vapor or breath, the very essence of life. In this book, I present for the first time the specific principles and color directions that the ancients used. This is a system of order founded in predynastic China and is still followed in many parts of Asia today. From What Sources Does Feng Shui Chic Spring? The body bagua chart, which you'll soon see on the following pages, is based on an ancient text that has only recently been presented in the West. I have spent countless hours examining the translations of the Chou Silk manuscripts, which date from 300 B.C., and which are now on exhibit in the Arthur Sackler Foundation in Washington, D.C.
What, exactly, is the body bagua? It is a system based on Chinese aesthetic medicine. In a later chapter, I will explain this concept in full, but for now you can think of the body bagua as a feng shui placement chart for the body. According to the body bagua, certain body parts align with what the Chinese call guas -- or what I call life zones. These zones reflect life areas, such as wealth, fame, and love. The chart tells the story in visual terms. The Chou Silk manuscripts are extraordinary in many ways. I was especially struck by the representations of the seasons that an early calendar includes. In each season, we see the five elements -- earth, water, wood, metal, and fire -- and corresponding colors. These fascinating manuscripts show, above all else, how the season, elements, and colors connect with nature to manifest energy flow. What this means is that we can manipulate Color to balance out energy and reach our goals in life. Just as the ancients did, you, too, will learn how to use your feng shui colors to counteract negativity and ensure a successful outcome in all areas of your life. But first, let's learn more about feng shui itself before delving deeper into the subject of Feng Shui Chic. And that's precisely what we'll do in the next chapter; come there with me now. Terah Kathryn Collins bestselling feng shui author and founder of the Western School of Feng Shui A playful and powerful book, Feng Shui Chic gives you the feng shui panache to look your best, inside and out. Julie Chen news anchor of The Early Show on CBS and host of the CBS reality show Big Brother Carole Swann Meltzer's application of feng shui to my wardrobe has helped me in ways I never imagined. I wouldn't trust just anyone, but I trust Carole completely.